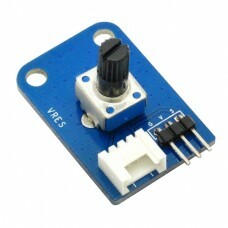 The Analog Rotation Sensor is an analog potentiometer mounted onto a handy module. This tiny module provides a 10k Ohm potentiometer mounted onto a small module for your convenience. It has a standard 3 pin SVG Signal, Voltage, Ground male header connector and a Grove compatible 4 pin connector. Two screw holes are available for permanently mounting the module to your project. Usage: Connect the (V) voltage and (G) ground pins to your system power supply and the analog output (S) pin to an analog input on your robot's controller. The value at the analog input will vary as the knob is turned. This module will work with 3.3V and 5V microcontrollers.